Do you wish you were on a Greek island? Yeah, me too. When my husband saw the epic post that was the Teriyaki sliders he told me off for writing overly long and complicated posts. So this post is a very simple recipe with very few base ingredients. It also happens to be my favourite food as a child. Prawn saganaki is a wonderfully simple and yet very tasty dish usually served in the summer in Greece when sweet, ripe tomatoes are abundant. My mother always cooks this with whole, large crevettes (shrimp) head and all. This adds a lot of flavour to the dish (and makes it very messy to eat), but they are sometimes hard to find in the UK. I used frozen raw prawns here, but do use fresh ones if you can. The secret to this dish is using fresh tomatoes – the best and ripest ones you can find. Don’t bother making it with canned tomatoes – it will not taste the same. You can leave out the sugar if your tomatoes are very sweet, but don’t leave out the soy sauce – it greatly enhances the flavour of the sauce. In fact any tomato-based dishes (such as bolognese and shepherds pie) always benefit from a splash of soy sauce (addicted, moi?). This tomato sauce is also great on homemade pizza if you reduce it a bit more. Notes: In Greece the pan is sometimes deglazed with Ouzo, but I really love the slight smoky flavour of Tequila here. Don’t worry about the alcohol – it burns off. I have kept the olive oil to a minimum – in Greece they add much, much more. Score a small ‘x’ on the base of each tomato. Put them in a large bowl and cover them with boiling water. Leave them for a minute, then peel the skin off each one. Quarter them and remove the seeds. Roughly chop them – try to reserve any liquid (you may need to sieve them to discard the seeds). Chop the shallots and fry them with the garlic cloves over low heat in a little olive oil for 5-10 minutes until very soft. Add the tomatoes and their liquid, the sugar, celery sticks, bay leaf and soy sauce. Bring to the boil then simmer for 30 minutes until reduced. Taste and season with salt. Discard the celery sticks. Use a potato masher (or stick blender) to blend the sauce a little. Pour the sauce in a small ovenproof dish. Preheat the oven to 180c/350F. Rinse and clean (devein) the prawns if you prefer – I usually don’t bother. If you are using frozen prawns then defrost first. Pat them dry. Heat 1 tsp of olive oil in a pan until very hot then sear the prawns for a couple of minutes. They will very quickly turn pink. Add a splash of soy sauce and a splash of tequila and flame the pan (if you are using a gas stove). Add the prawns (and any liquid) to the tomato sauce and mix. Pour the sauce in an ovenproof dish and layer the sliced feta on top. Drizzle with olive oil and sprinkle oregano on top. Bake for 30 minutes until the feta melts slightly (you can also grill it for a few minutes to speed it up). Let it cool a little, sprinkle with fresh thyme leaves, season with salt and pepper and serve either with crusty bread as a meze or with white rice as a main meal. Made this tonight. Used tequila as suggested and very good. Thanks for a great recipe! 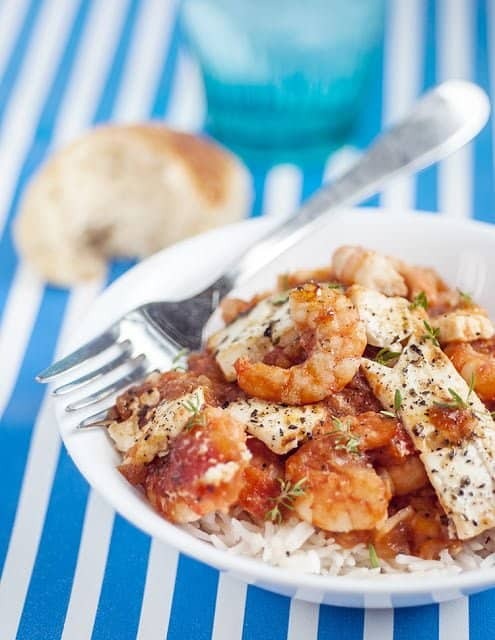 I am really intrigued by the prawn/feta/tequila/soy combo in this dish. It looks and sounds amazing and I am definitely going to try it. Just as an aside, I absolutely love your photography and was wondering if you'd share your secrets. Do you have any specialist equipment and which photo editing software do you use? I have a good digital camera (Nikon D300), and a tripod (which I tend not to use as it limits the angles you can shoot from). To edit the images I use Lightbox and Photoshop software. For props I use whatever I cook with and serve on, but have collected lots of interesting bits and bobs over the years. And I collect anything that could be used as a background mostly from skips! Sorry that should be LightROOM not Lighbox!